Rafi Peer's Mystic Music Sufi Festival is one of Pakistan's most celebrated events that brings together Sufi artists from a vast variety of disciplines and cultures from across Pakistan and joins them as one, creating a magnificent, unforgettable showcase promoting peace, harmony, tolerance and compassion. 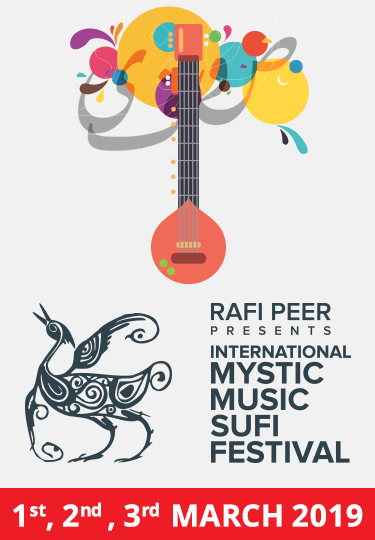 The Mystic Music Sufi Festival is a beautiful culmination of music, poetry, thoughts and philosophies, drawing a huge and diverse audience to the festival venue over the three day event. to date the festival has staged some of the most remarkable collaborations and performances to ever have graced the stages of Pakistan. Held at Alhamra Cultral Complex Gaddafi Stadium, Lahore the festival provides an exhilarating experience to enjoy some of Pakistan's best musicians and traditions.